Last week I reported that AT&T MVNO Airvoice Wireless (888-944-2355) had made changes to two of their plans. The changes included increased data and the elimination of "split data" on the $30 and $50 unlimited talk and text plans. It turns out there's a little more to the story than I originally reported. The $30 plan is indeed getting more data, 1 GB instead of 500 MB per month and the $50 plan is going from 2 GB to 5 GB. But there's a catch, only the first half of the data, 500 MB on the $30 plan and the 2.5 GB on the $50 plan, will be delivered at full HSPA+ 4G speed. The second half of the data will be throttled to a lower speed, which I suspect will be 128 Kbps. While the news isn't quite as good as it first sounded, I still think it's a huge improvement. The $30 plan has as much high speed data as ever and the $50 plan has a bit more. Both plans now include some bonus throttled data and best of all, users never have to call in to get all the data they paid for. According to an Airvoice representative, the company's $40 and $60 plans, which had 1 GB and 3 GB of split data respectively, are being phased out.. There are no other changes to plans and the $50 plan still includes unlimited international calling to over 70 countries. Still not the best budget deal. Metro PCS: Two Lines for $50 - No Fees, No Tax. Unlimited with 1GB of 4G. If your willing to go with an average smartphone (Alcatel One Touch Fierce 2, 5" screen, for only $29), just cant beat it. Metro PCS is Tmobile though, you can't compare the two. There are better ATT plans though. Cricket is pretty much the best value in the business and blows this away.
" just cant beat it." You can if you with Cricket. 5 times or 10 times the data (depending on if you match the $45 Cricket plan to the $50 MetroPCS plan, or match the $45 Cricket plan to the $50 MetroPCS plan. That's not just a little better: it's many times better. And you get twice as much coverage with the Cricket plan, too. Where you lose compared to Cricket is higher ping times/latency, and the 8mpbs limit with Cricket. Still good enough, though. to watch Netflix and do Skype voice calls with no delay through the Cricket towers. Cricket also allowed hotspot, while MetroPCS banned it, apparently. But it looks like MetroPCS has stopped this practice very recently. 2 lines for $50? I haven't heard about this deal. It's two $30 plans with the $5 per line multi-line discount. I would be with MetroPCS in a heartbeat if the coverage were there :-( Since coverage is key, I'm stuck with VZW Prepaid. If coverage is really key, go with Selectel. It includes Verizon POSTpaid coverage. "The $30 plan is indeed getting more data, 500 MB instead of 1 GB per month"
I don't think cutting the data in half for the $30 plan is "indeed" giving it more data. 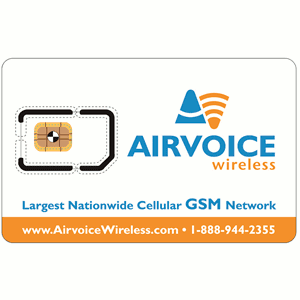 The Airvoice plan was never 1 GB until now. It was 500 MB split into two 250 MB chunks. Now it's 500 MB high speed plus 500 MB throttled. 1GB, even if part or it is throttled, is indeed more than 500 MB. But the big improvement is that you no longer have to call in to get the second half of your data. "The $30 plan is indeed getting more data, 1GB instead of 500 MB per month"
One has to compare the sentence to your initial reportage to get the gist: "The $30 plan is indeed getting more data, 500 MB [without interruption, followed by another 500 MB of throttled data] instead of [the] 1 GB [uninterrupted] per month [that I initially reported]"
I think the initial poster meant to point out a typo. Should be "1 GB instead of 500 MB per month" instead of "500 MB instead of 1 GB per month" above. Thanks to all of you for pointing out the typo, which I have corrected. It's interesting... Before in the ( NOT too distant) past, the network operators treated PREPAID Customers like 3rd Class Asylum seekers who should be GRATEFUL for the HONOR of paying the Big Corporations... Now with so many choices to choose from as a result of competition in a MIXED ECONOMY ( READ: Partial Regulated Market) , which is GREAT, we consumers have both a plethora of choices to choose from; and the option of NOT having to put up with some of the stupid games that some of these mobile operators play! Will H2O match? That is the question. Do we know for sure it will be throttled to only 128kbps? The low speed that Airvoice refers to could still be decent, just not as fast as full HSPA+ speeds. Maybe even as high as 4Mbps (ala Cricket). Could be 256kbps, could be 1 Mbps; I guess we won't know until someone reports it. 1GB high speed with data split on the $30 plan, or 500MB high speed + 500 MB throttled as they offer now? Clearly it annoyed many people and that influenced AirVoice, but I did not mind sending 1 text to their email address once per month so that I could have all high-speed data. Not 100 percent. But according to AV's CS (which is above average), the first half is high speed up to non lte 4g and the second half is 2g/3g. They could not clarify an exact answer o how fast that would be. If it's low to mid speed 3G (say 250k to 1 mbps) that's not too bad but if its 2G/edge or less, it may be kind of meh. We'll see. Too new to tell till it's tested. Still no more split data and the plans are being streamlined. Nice move. a rep told me last month that they are getting LTE this summer. can anyone confirm this? Airvoice doesn't currently offer LTE. I haven't heard that they have any plans to either. Hi Dennis, it's interesting that during checkout at AV, the following description is given: "$50 Unlimited Talk, Text, MMS & 5GB Web [2.5GB Highspeed LTE 2.5GB Reduced Speed]". They use the term LTE! However, I'm still getting HSPA+ 42.2 Mbps because that's the limit of my Nexus 4 (no LTE radio). So I'm curious if their LTE description is true, and if so, what does "Reduced Speed" refer to? Airvoice doesn't have LTE yet as far as I know. Reduced speed is probably 128 Kbps.